This has been a weird week. First I was exhausted, then I almost burned the kitchen down and had to plunge the overflowing toilet (not my fault!) all in one night, then today I feel awful for several hours at work. I miraculously felt better by the end of the day and got to go to the gym anyway. I think maybe I’ve got a sinus infection or something. Who knows. I just can’t wait to make it to the weekend so I can finally get a couple nights of good sleep minus the alarm. So the gym today – I hopped on a treadmill and made up my own workout! I’m calling it the Thunder and Lightening Treadmill Worout. I like the ones that have fun names and less to read. Plus this really was like a thunder and lightening workout . 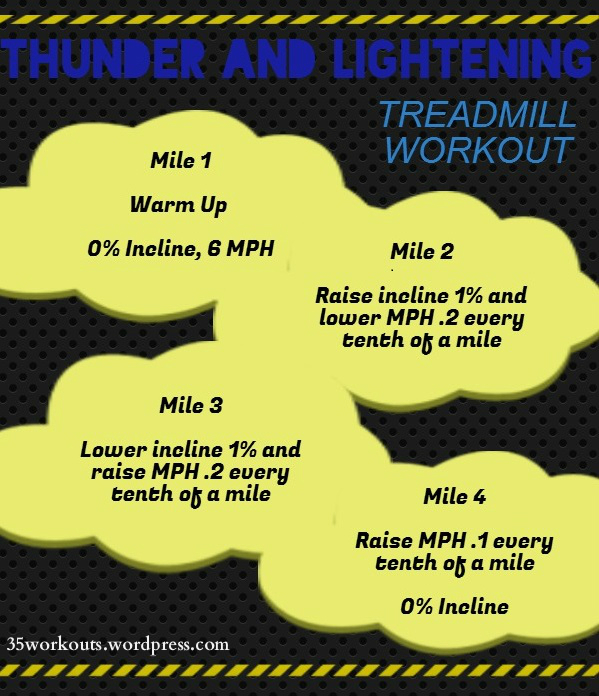 After a one mile warmup, the next two miles you’re getting slower but using more muscle – thunder. The fourth mile is when you speed it up to your max – lightening. I would have burned about 550 calories on the workout (including a 3 minute walking warmup and 5 minute walking cool down. It’s too bad that I realized around mile 2 that the incline wasn’t working on my machine. I quickly hopped onto another machine with a working incline to finish up. It was a lot harder than I thought especially trying to not hold onto the rails when it got steep. Anyway, I’m glad I got to the gym despite not feeling great. Do you workout when you don’t feel well? Any helpful hints to make it bearable?